Gentle-spoken with a serene smile, Julia Moon, general director of Universal Ballet, is a picture of calm and elegant beauty. Her impeccable posture and graceful turn of head give away her career as a ballerina. At home in Hannam-dong, Seoul, in mid-November, Moon is followed around the house by a toy poodle named Ginger. The house is filled with photographs and memorabilia of her famous in-laws, a reminder of her ties with the late Rev. Moon Sun-myung of the Unification Church. At 21, she wed Rev. Moon’s son who had died in a car accident in a “spiritual wedding.” A drawing by her husband as a young boy is displayed at the bottom of the staircase. We start off the interview by noting that this year marked the 30th anniversary of the private ballet company. The year kicked off with a gala performance in February and the troupe was invited to perform in Oman. From Oct. 24 through Nov. 1, the Universal Ballet went on its first-ever South American tour, performing “Shim Chung” and “This is Modern” at the 1,300-seat Teatro Mayor of the Julio Mario Santo Domingo in Bogota, Colombia. Although several of the 55 dancers suffered from altitude sickness while performing the more vigorous “This is Modern,” the tour was a great success, according to Moon. “When Universal Ballet was founded in 1984, there was very little understanding of classical ballet. There were no audience members and students from Sun Hwa Arts School next door were the main audience in the beginning,” recalled Moon. Moon joined the Universal Ballet as a founding member, having previously been with the Washington Ballet. In 1996, she retired from dancing, assuming the post of general director of the Universal Ballet. “We covered in 30 years what Western ballet covered in 400 years,” said Moon, reflecting on the company’s history. 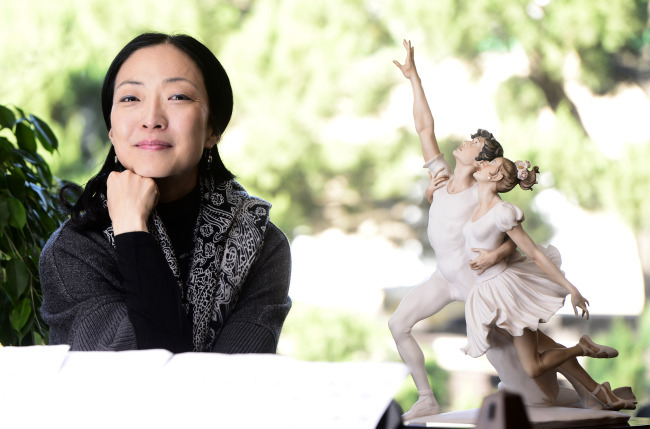 While the company is based on classical ballet tradition, Moon introduced contemporary ballet in 2001, a move that was not liked by her father, a high-ranking member of the Unification Church, she explained. That turn toward contemporary ballet eventually led to the departure of Oleg Vinogradov, former artistic director of the Kirov Ballet, who served as the artistic director of Universal Ballet from 1998 to 2007. “We never imagined someone like him would work with a primitive company,” said Moon, explaining that it was under Vinogradov that the company inherited the ballet tradition of St. Petersburg. Building a repertoire is a difficult task, something that happens only after a ballet company earns recognition. “It took 17 years to get John Cranko’s ‘Onegin’ in 2009. We got it before the National Ballet of Japan,” said Moon with a note of pride in her voice. This time of the year, Koreans are treated to two versions of “The Nutcracker”― one by the Universal Ballet and another by the National Ballet of Korea. “You will be able to see the difference between the Bolshoi and the Kirov ballet. The Bolshoi piece is like painting with a big, thick brush. Lots of big dancing by male dancers. On the other hand, the Kirov version is like a painting with a fine brush,” Moon explained. “The fact that we have two ‘Nutcracker’ (ballets) is more of a celebration than a rivalry,” she said. If she were asked to wed spiritually today, would she do it, now that she is no longer a young woman? “I grew up accepting that Rev. Moon would choose who I would marry. He always talked about living for others. I interpreted it as meaning loving unconditionally. I wondered, ‘What if he is black, French, fat or handicapped?’ I thought of all the possibilities, but reality is difficult,” she said. Contrary to what many people think about her marriage, Moon said she did have a choice. “I had a choice. Once you go through adolescence, children will choose what they choose. It made sense to me. You cannot force anyone to do what I chose to do. You can’t fake it or force it,” she said. Opening up a page from “Book of Birthdays,” Moon showed me her birth date. The page is titled “Day of Destiny.” Several Post-it flags have been stuck to different pages, marking her family members’ birthdays. She has a daughter, 12, and a son, 22, both adopted as infants. “It is really accurate,” she said with a laugh. “When I married, there was no plan for a ballet company,” Moon said. “In 1976, Adrienne Dellas first came to teach in Korea. It happened to be the year I joined Sun Hwa Arts School. It takes eight years to train a professional dancer and the ballet company was founded in 1984. I didn’t know I would marry this way, and the director didn’t know there would be an accident (in which my betrothed would be killed). The nuts and bolts fell into place,” she said. It does sound like destiny. Looking ahead to the next 10 years, Moon is preparing the next generation of teachers, dancers and administrators. She would also like to complete a trilogy of original productions based on Korean folklore. The three-act classical ballet-style “Shim Chung” premiered in 1986 while the neoclassical ballet “The Love of Chunhyang” in two acts is still being fine-tuned even as it is being performed on stage. “Heungbu and Nolbu,” a one-act humorous contemporary ballet, would complete the trilogy. “After we complete ‘Chunhyang,’ I would like to start working on ‘Heungbu and Nolbu’ although the planning department does not think it will sell well,” Moon said. “I always talked about a trilogy of the most well-known traditional stories children grew up with. ‘Shim Chung’ deals with filial piety, ‘Chunhyang’ concerns chastity and romantic love. ‘Heungbu and Nolbu’ talks about brotherly love. These stories encompass our value system from the old times,” Moon explained. “With ‘Heungbu and Nolbu,’ I want to make it modern, bring it to this era. It would be completely modern, no pointe shoes,” she added. While her work occupies all her time now, she looks forward to the day when she will be released from it all. “There are so many things I would love to do. Horseback riding ― I imagine myself galloping and cantering on a horse one day,” she said. “I’m really a homebody. I like housekeeping. I think I’d have been a very good housewife. I like reading, studying theology and world history,” she said.